The National Weather Service has issued a Winter storm watch effective from late Wednesday night through late Thursday night. 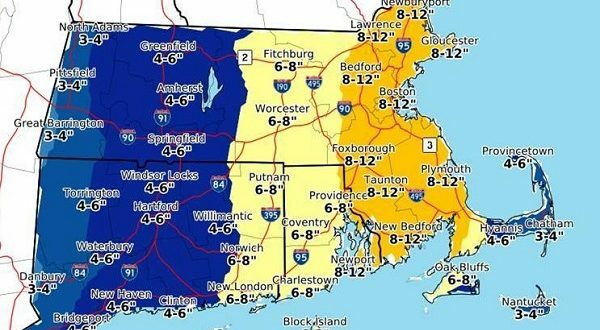 Total snow accumulations of 8 to 12 inches. 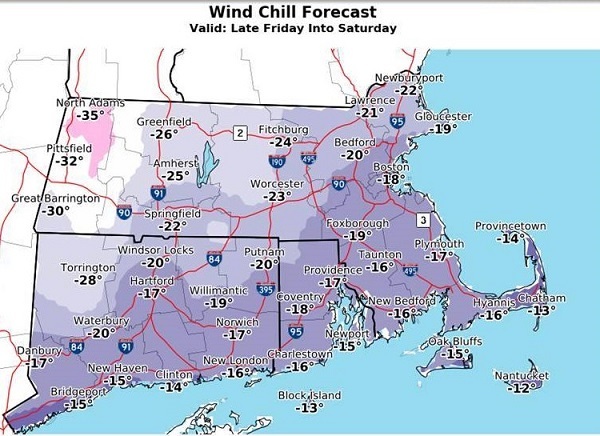 Damaging wind gusts and power outage risk a big concern across eastern MA/RI given bitterly cold wind chills of 15 to 35 below zero to follow later Friday into Saturday. * WHERE…Portions of eastern, northeastern and southeastern Massachusetts and northern and southern Rhode Island, Including the cities of Gloucester, Foxborough, Norwood, Cambridge, Boston, Quincy, Taunton, Brockton, Fall River, New Bedford, Mattapoisett, Foster, Smithfield, Providence, Coventry, West Greenwich, East Greenwich, Warwick, West Warwick, Bristol, Narragansett, Westerly, Newport, and New Shoreham. * ADDITIONAL DETAILS…Significant reductions in visibility are possible including near blizzard conditions for a time Thursday.